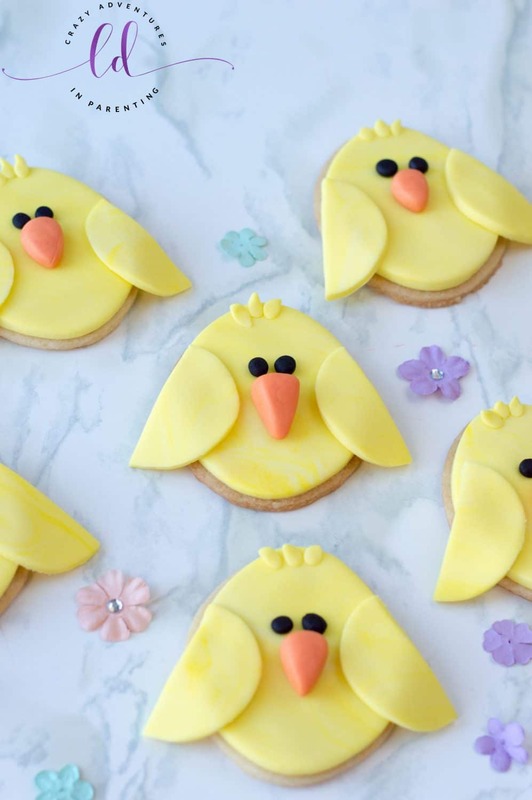 These Chick Cookies are the absolute CUTEST and are so perfect for your Easter or spring celebration! 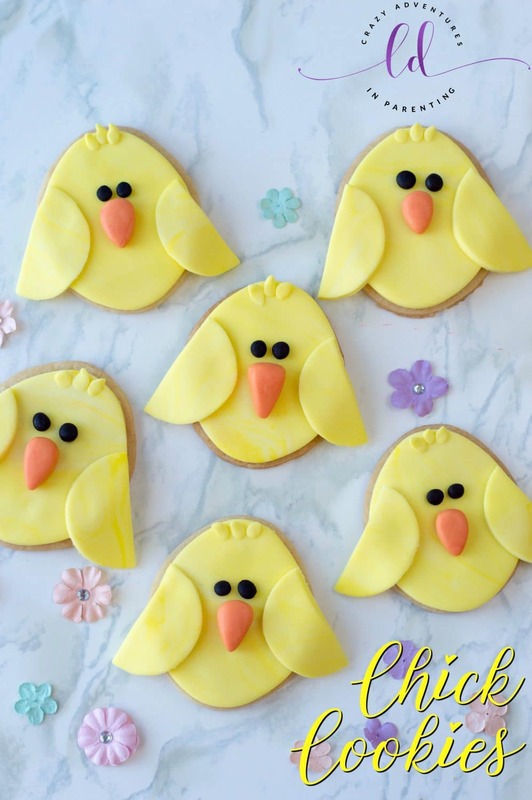 Easy to make and decorate, these festive Easter Chick Cookies make the ideal dessert! 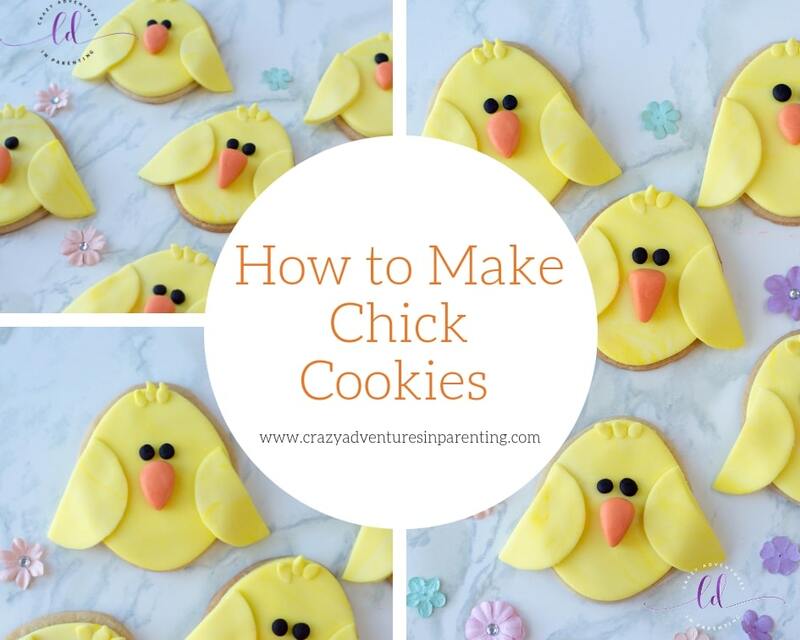 After we made our Chick Cupcakes, I couldn’t resist making these Chick Cookies as well. It couldn’t be helped! They’re adorable cute chicky little faces with their beady black fondant eyes staring back at me – gah! I couldn’t help myself. Are they not the cutest? These are going to go over SO BIG in my first graders class next month!! She requested I do it, she wants to share ’em with her friends – isn’t that cute? I can’t get over how fantastic these turned out. The kids loved using their egg-shaped cookie cutter for something other than making egg cookies! They loved helping with this recipe. Who wouldn’t? Making these Chick Cookie faces out of ready-made fondant is so much fun, and they know it and wanted in on it too. Making memories together over baking confections, isn’t that what it’s all about? A lot of my baking creations call for ready-made fondant. Why? Because I want to be able to do the things I want to do with these recipes without the fuss of making homemade fondant (and sucking at it, because I do lol). We have had many unsuccessful attempts in the past, and I’m just going to stick with what I know, you know? I enjoy baking, and I super looove decorating, but if making fondant from scratch is too hard, I’m not going to do it, and use the ready-made stuff instead. It comes out gorgeously every time! My kids love decorating our cookies, cupcakes, and other confections, especially when it calls for fondant. Digging into it it and getting the shapes set up and molded is the funnest for them (and, quite frankly, for me as well). Fondant feels an awful lot like edible clay to me, you can do so many wonderful things with it, and the kids love helping because of it! Such a sweet way (pun unintended but perfect) to help celebrate the warmer weather, you know? The birds chirping, the marshmallow Peeps afoot, grass from their Easter baskets and cute trinkets, bubbles, kites, and all things fun! I loove celebrating spring and the return of warmth. I love planting on Easter, too! Getting my hands in the dirt, there’s nothing like it! Bake according to recipe’s directions and allow to cool completely before decorating. 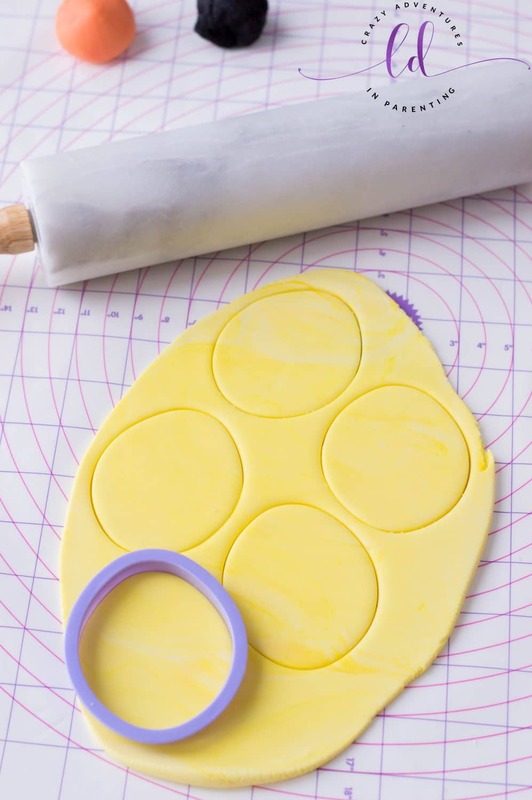 Roll out your yellow fondant with a rolling pin so that it’s about a quarter of an inch in size. Cut out twelve egg-shapes. Press a yellow fondant egg-shaped piece on each cookie. Roll out your yellow fondant again and cut out twelve circles with your cookie cutter. Cut each yellow circle in half. Place one each side of your cookie – these demi-circles will act as your chick’s wings. Roll out twelve spheres from your orange fondant, about half an inch in size. Flatten each orange sphere slightly, pointing one end. These will act as your chick’s beaks. Roll out twenty-four spheres from your black fondant – about a quarter of an inch in size. These will act as your chick’s eyes. Assemble your chick’s face beginning with the beak, then the eyes. Brush the back of each piece with a little bit of water and a paintbrush in order for the fondant to stick to each other. 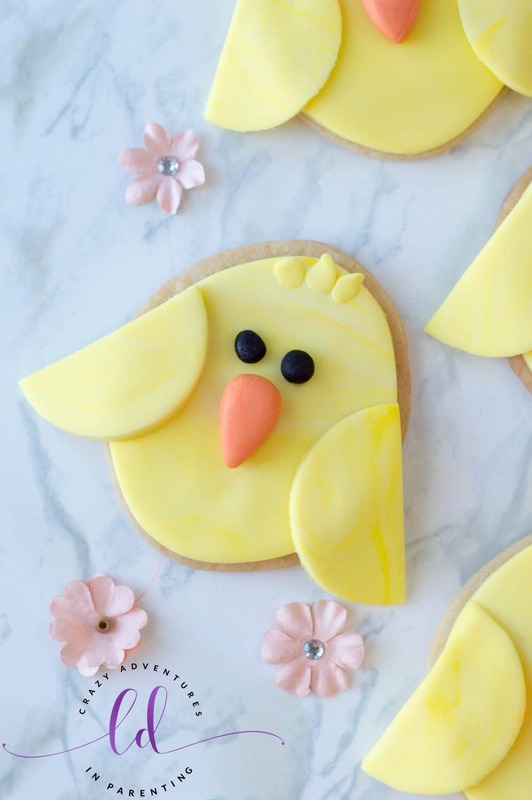 With some of your remaining yellow fondant, roll out small strips to act as your chick’s little fur strands at the top of its head. Serve and enjoy! Full measurements for this recipe and instructions can be found below! 🙂 What do think of this Chick Cookies recipe? Will you make them for your next spring or Easter celebration? Check out my other cookie recipes and dessert recipes while you’re here! Preheat your oven according to your cookie’s directions and line a cookie sheet with parchment paper or a silicone baking mat. Bake according to recipe’s directions and allow to cool completely before decorating. Roll out your yellow fondant so that it’s about ¼ of an inch in size. Cut out 12 egg-shapes. Press a yellow fondant egg-shaped piece on each cookie. Roll out your yellow fondant again and cut out 12 circles with your cookie cutter. Cut each yellow circle in half. Roll out 12 spheres from your orange fondant, about ½ an inch in size. Flatten each orange sphere slightly, pointing one end. These will act as your chick’s beaks. Roll out 24 spheres from your black fondant – about ¼ of an inch in size. These will act as your chick’s eyes. Assemble your chick’s face with the eyes and beak. Brush the back of each piece with a little bit of water in order for the fondant to stick to each other. With your remaining yellow fondant, roll out small strips to act as your chick’s little fur strands at the top of its head.